“Got anything planned for the weekend?” workmates asked me on Friday. Yeah… so much for that! 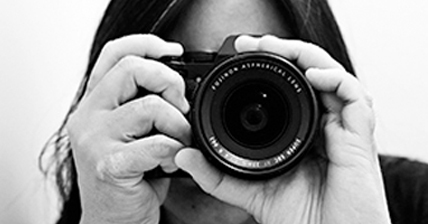 As it turned out, I had completely forgotten we made plans for Saturday a while ago – Jac reminded me on Friday night – to take her uncle and aunt from Queensland to the Swan Valley. And so I admit I was a bit grumpy when I woke up on Saturday morning… but it didn’t take long for my mood to improve. We love taking visitors to the Swan Valley, located approximately 25 minutes from the Perth CBD. Each time, we follow a different itinerary along the Swan Valley food and wine trail, depending on everyone’s interests. Our first food stop was Uncle Neal’s choice, after we uttered three magic words: The Cheese Barrel. Actually, probably only one magic word, as I don’t think he cared about the words on either side of ‘cheese’! 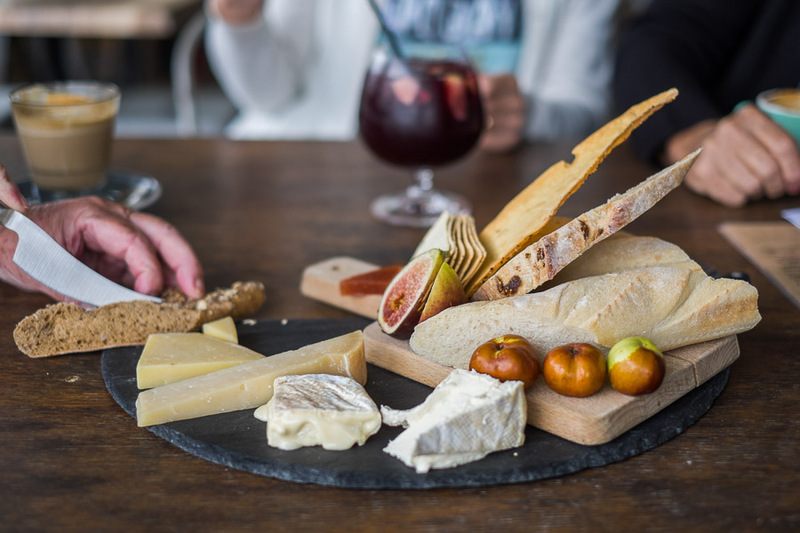 We sat out on the deck and designed our own cheese platter, choosing four cheeses from the Ultra-Premium selection: Farmhouse Gold, Healy’s Pyengana Cheddar, Brillat Savarin and everyone’s favourite, Yallingup Brie. Four cheese design-your-own platter (Ultra-Premium selection $51, served with various goodies to go with the cheese) – left to right: Farmhouse Gold, Healy’s Pyengana Cheddar, Brillat Savarin and Yallingup Brie. In the background, Auntie Karen’s sangria, which she declared a perfect match for the cheeses. After several stops (Mondo Nougat, Morish Nuts, Whistler’s Chocolate Co and The Great Northern Distillery) we went to Lamont’s Swan Valley where we sat down to lunch after a free wine tasting at the cellar door. Jac and I had a fantastic lunch at Lamont’s Swan Valley a couple of years ago, and yesterday’s was just as enjoyable – I really am a big fan of the place. The food is excellent, and the setting is relaxed and informal, especially if you sit at the wooden tables outside. We each picked a dish to share. Veuve, the Jack Russell terrier we met on our previous visit, patrolled the grounds, while black labrador Truffle hovered, hoping for treats. Duck, chilli and rocket arancini (AU$14.50 for 4 pcs) with parmesan aioli. 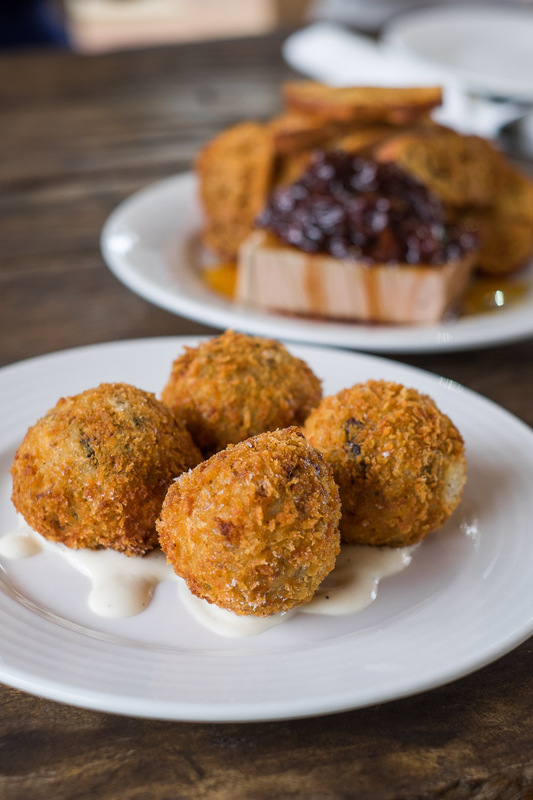 Crunchy on the outside, gooey on the inside and packed with flavour. 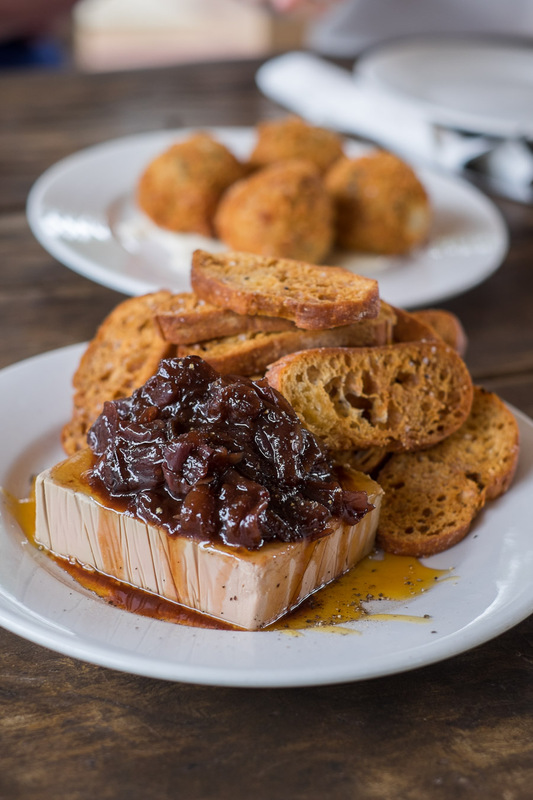 Lusciously smooth duck parfait (AU$17.50) with caramelised onion jam, orange syrup and crostini. In retrospect, we should’ve ordered extra bread to go with this – when all the crostini had been eaten, the last of the parfait was consumed smeared on the final pieces of whiting! 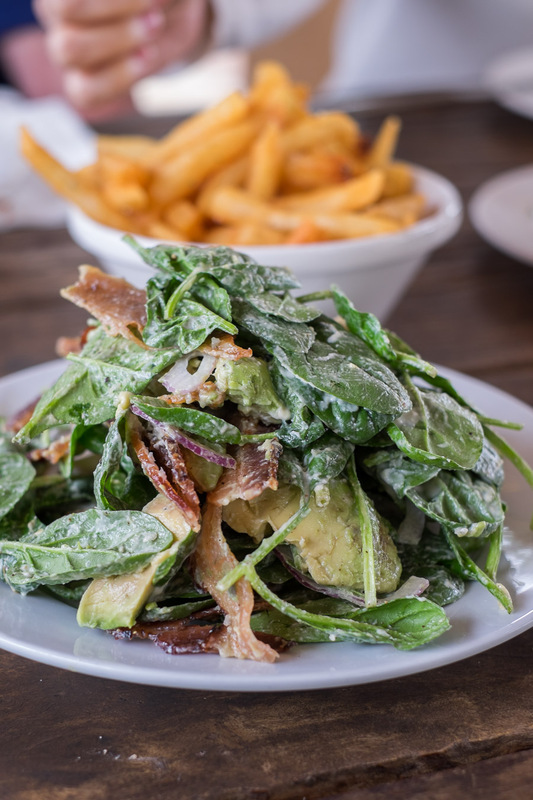 Spinach salad (AU$18.50) with Holy Smoke bacon, red onion and avocado, all coated beautifully with blue cheese dressing. I can’t believe I’m saying this, but there may have been too much bacon. We all agreed the salad was noticeably salty as a result, but we enjoyed it nonetheless. 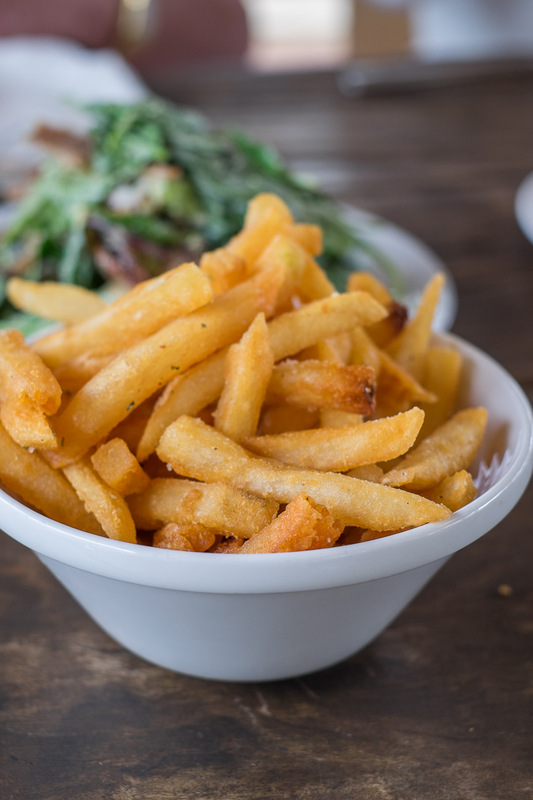 Straight cut chips (AU$9) with rosemary salt – golden and ultra crispy, with not a single floppy chip in the bowl. They were heavily salted, but highly moreish. 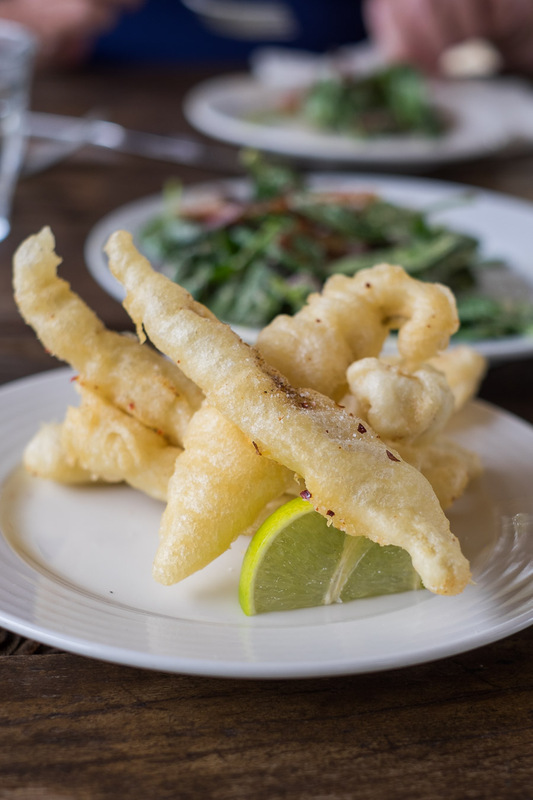 Tempura battered Shark Bay whiting fillets (AU$22.50) with chilli salt and fresh lime. We got two servings of this. The seasoning was just right on the whiting fillets, with just a touch of heat from the chilli flakes, enhanced with a squeeze of the lime. The temperature was quite mild yesterday, in the low to mid-20s (Celsius), ideal for being out and about with no worries about the chocolates melting in the car. The sky was grey and overcast, with just a brief period of light drizzle. And although the day was cool, it didn’t stop us from having honey ice cream at The House of Honey before we headed home. 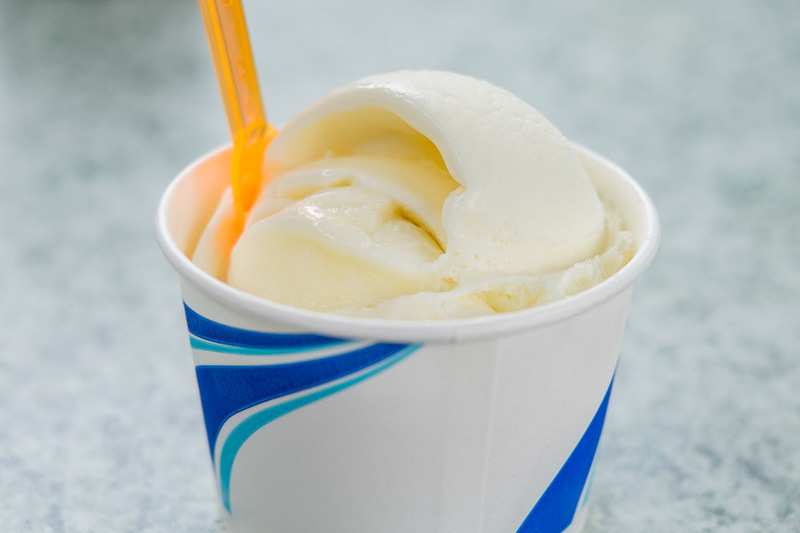 My honey ice cream (AU$4.50 for one scoop in a cup). Besides the original honey ice cream, yesterday’s flavours included ginger with honey, honey with honeycomb chunks, strawberries and cream with honey drizzle, chocolate and honey, and mango with honey. The House of Honey is one of my favourite stops in the Swan Valley. PS. I got my sleep-in today! I didn’t take pictures at all of our stops, but in case anyone is interested, I’ve included a list below of the places we went during our four or so hours in the Swan Valley yesterday. 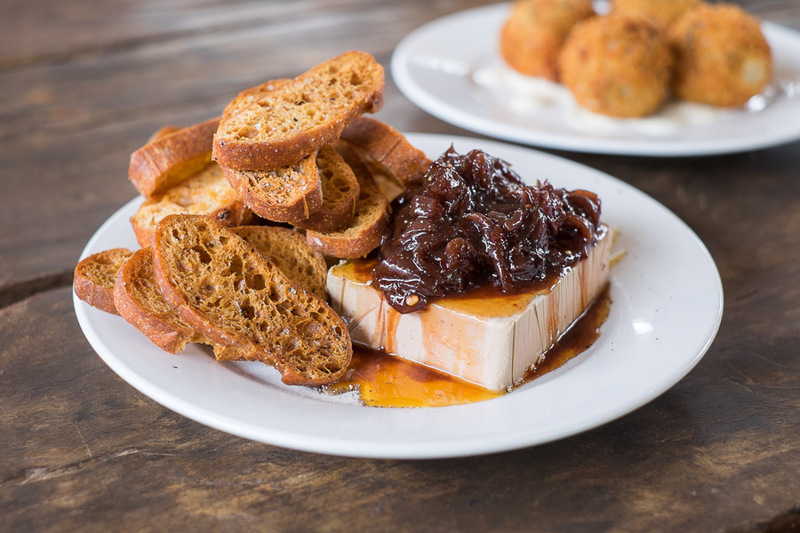 The beauty of the Swan Valley food and wine trail is that most places are on or just off two main roads – the Great Northern Highway or West Swan Road – and the tourist attractions are well marked on brown signs, so it’s pretty easy to navigate. Get the Swan Valley food and wine trail map here (PDF 822KB). A tasting session (6 wines) is $10 per person, or free if you end up purchasing any wine. Also see my previous blog post on The Cheese Barrel – as you’d expect, the menu has changed since then. In addition to nougat, they sell homemade gelato and Italian cakes, pastries and biscuits, to take away or enjoy in the cafe. Free sample of nougat available only upon request. Highly addictive candied caramel-coated roasted nuts. Yesterday we also sampled wasabi macadamias, abalone macadamias and chilli dusted versions of the caramel-coated nuts. Free tastings, chocolates to buy, a cafe and a grassy area out the back for the kids to run around. No free tastings, but you can purchase rum tastings for $4 per 15 ml measure. Also see my previous blog post on Lamont’s Swan Valley. Free tastings, honey products and my favourite, honey ice cream.